No need to trek to the East Coast for great seafood. A trip to Findlay Market does quite well to help me get my fix. 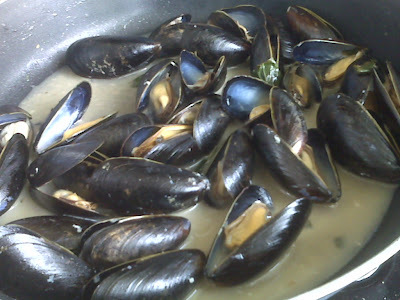 A pound of mussels sauteed in olive oil, butter, white wine, garlic and basil. 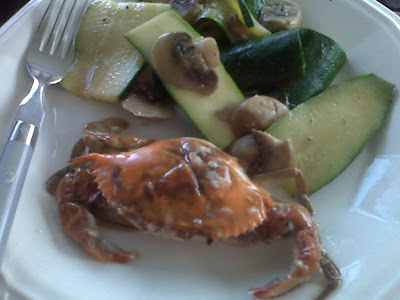 Sauteed softshell crab with zucchini and mushrooms. How could anyone think Red Lobster is real seafood? We should make lobsters sometime. I am scared to do it alone! Are both of those results of your own cooking? I'm impressed. Kitty - I'm totally down with a lobster boil! Everyone can bring their own (I think Lukens is selling their for $12 each right now!!!) Maybe we plan it for an end-of-summer event? !